I hope these grilled turkey recipes make you very happy. Turkey is one of the most misunderstood meats in all of the culinary world. We've all had it, we've probably even loved it on Thanksgiving all slathered up in gravy and mashed potatoes, but we all have to admit that most turkey we eat alone is dried out and flavorless. Rescue your taste buds! Turkey doesn't have to be like that! Even grilling turkey, which may have a tendency to dry it out, doesn't have to result in dry, hard, leathery turkey. So how do you avoid dried out, flavorless turkey? Easy, one simple solution… brining! Both the turkey drumsticks and whole brined-turkey below use a brine solution to infuse and seal in juices and flavor. After a good brining, turkey tastes better, its more tender and it stays juicier, even if you over cook it a little. So try it out next time you plan to grill… your taste buds will thank you! Check back soon because I try to add new grilling recipes often! Big Ol' Grilled Turkey Drumsticks - There is something very primitive about eating a whole grilled turkey leg. I feel like a caveman sinking in my teeth. These bad boys are brined first to give them a great rich flavor and then glazed with a sweet, tangy sauce. 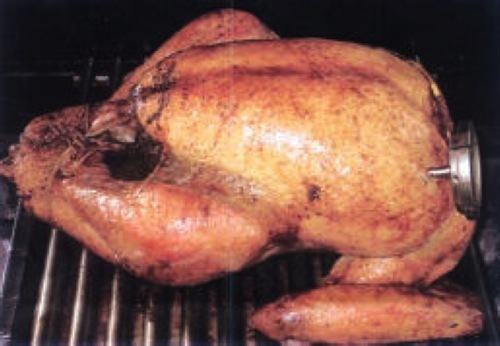 Grilling Turkey: Brined-Turkey - Want to spice things up this next Thanksgiving (or whenver you want some good turkey)? Impress your family and friends by grilling that big bird this year. Infuse wonderful wood smoke flavor into your bird while keeping the meat tender, juicy and succulent! This also uses a brine to seal in flavor and juices. 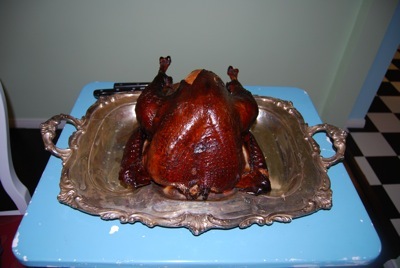 Barbeque Turkey: Glazed Turkey - A reader from Panama contributed this great smoked/grilled turkey recipe. The beer sauce helps keep it moist and the rich glaze and smoking woods both boost the flavor. This is another great option for your holiday bird or just about any time! Turkey Stuffing Recipe - OK, so this isn't exactly a turkey recipe, but what is turkey without stuffing? 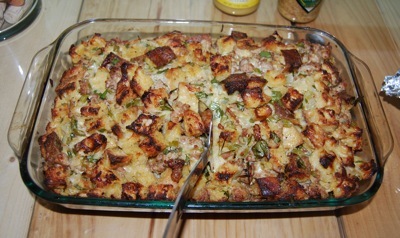 This is quite simply my favorite stuffing recipe I've come across. It is delicious, even if it's not Thanksgiving! Done with the Grilled Turkey Recipes page? Return to the main Barbeque & Grill Recipes page.